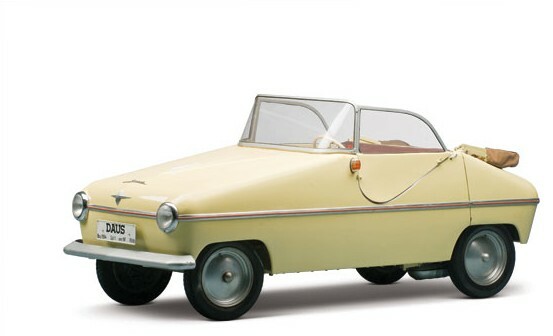 This prototype was built by Otto Daus in Hamburg, Germany in 1954. Daus was the chief engineer for Tempo, the German three-wheeled truck manufacturer. This car uses a 197cc single-cylinder making 9.5 horsepower. It can do 46 mph and was never registered for the road in Germany when it was built and it never entered production. This is the only one. And you can read more about it here. This entry was posted in Uncategorized and tagged 1954, cars, classic cars, daus, microcar, rm auctions by classiccarweekly. Bookmark the permalink.